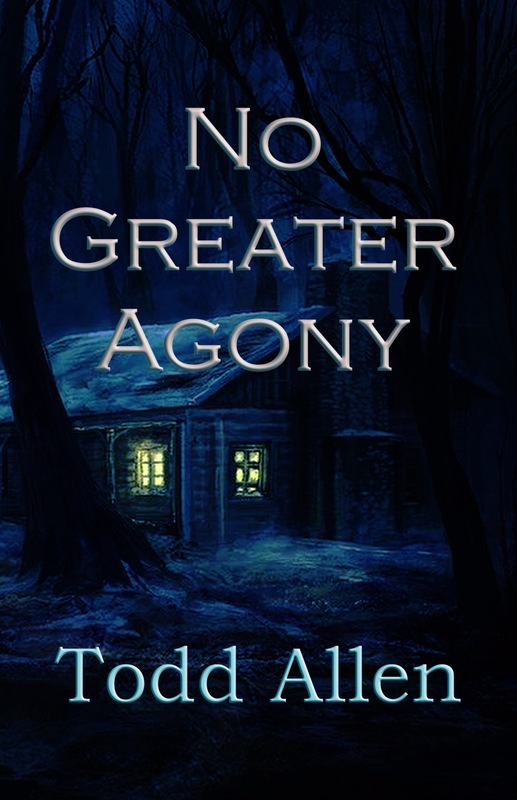 No Greater Agony by Todd Allen with excerpt. Jack Bishop always dreamed of becoming a writer. That ambition finally became reality with his critically acclaimed debut novel, but following up on that success has proved difficult. For over a year, he has failed to produce a new work and his publisher is losing patience. In a last-ditch effort to save his floundering career, Jack is sent to the renowned writer’s retreat, Wabasso Lake, with orders to finish his manuscript in record time. Jack’s first impression of Wabasso is that of an idyllic place to work, but despite being surrounded by awe inspiring nature and the lovely Kate, a fellow author, he continues to be plagued by self doubt. It is with the discovery of a hidden manuscript that Jack begins to scratch the surface of the retreat’s sinister purpose. As visions of fictional characters inundate Jack’s waking life, he is driven to the brink of madness. A diabolical intelligence has stirred. Wabasso wants something from Jack, but is he willing to pay that price to achieve his greatest desire? Jack has had a knock out of a first book!! Sadly, he is failing on his second novel. He just cannot seem to get it right. His publisher is pushing hard. He decides a change of scene is what he needs. He moves himself to a cabin on Wabasso Lake. This place is perfect….or so he thinks! Jack is a character, I am sure, many creative people can relate to. He is always second guessing himself, expecting so much more out of himself than he can give. When he moves to the cabin he thinks this is just what he needs to come out of his creative funk. He finds an old manuscript. This is where the story takes off like a rocket. Strange and weird things take place and is just about Jack’s undoing. This story has you by the seat of your pants and will not let go. There were times I had to put the book down and gasp for air. That being said, there were also places in this tale which were choppy and did not flow as well as I expected. Do not let that stop you from this enthralling read! I received this novel from Sage Adderley Blog tours for a honest review. Todd Allen lives on the East Coast of Canada. A lifelong fan of all things horror, Allen threw his hat into the literary ring in 2015 with his first novel, Sacra Obscurum. Allen is proud to follow up his debut with the 2017 release of the psychological thriller, No Greater Agony. Influenced by genre greats, M.R. James and H.P. Lovecraft, and raised on Stephen King and Peter Straub, Allen aims to deliver his own brand of creeping, cerebral horror. The trail branched off to Jack’s left. Cabin Five—Frasier’s cabin—was down there, tucked secretly amid the trees. A low hanging branch swayed as though someone had just pushed it aside while running past. That served enough intrigue for Jack, and seconds later, he pushed it aside as well. Cabin Five came into view a few yards down the trail. It reminded Jack of his own cabin, only more given to shadow from its taller, more oppressive neighboring trees. No one appeared to be home. Jack could see nothing in the windows, but the reflection of the sun dappled day. He leapt up the porch steps and knocked on the door. It sounded oddly hollow. “Frasier, you in there?” Jack called. He prayed his neighbor would come to the door, towel around his neck, perspiration dotting his brow, fresh from a morning jog. Perhaps a pair of headphones would explain why he hadn’t heard Jack’s greeting on the trail. He knocked again. The door creaked open a few inches under the weight of his knuckles. A spoiled fruit stench escaped the cabin. Jack recoiled and waved a hand in front of his nose. He called for Frasier through the opening and as he did, caught sight of the blood inside. His jaw went slack. He pushed the door open wide. All the furniture had been cleared to one side of the cabin—the desk overturned, the bookcase as well, the cot tossed atop it. The furniture seemed to be moved to make room for a solitary wooden chair in the center of the floor. A pool of congealing blood spread around it. Jack covered his mouth and nearly doubled over as the trash can smell of rot assaulted him again. It left a sour film on his tongue. Despite the flash of nausea, he stepped inside, careful not to set foot in the gore. The buzzing of black flies overpowered him once he was out of the summer breeze. Dozens of flies circled the chair, landing for split seconds at a time before lifting off again. Jack wondered how he hadn’t heard their dizzying drone outside. He felt the promise of vomit bubbling up from his core, but he forced himself to look more closely at the chair. Certainly, he would need to describe this scene to the authorities at some point. Scraps of rope hung loosely from the chair. Some lay in the blood around its legs. More clung to one of the wooden arms. A ruin of splintered wood was all that remained of the other arm. Jack bent to inspect it. The arm had been shorn in two, the likely result of a heavy blow. Fresh panic flooded his chest. The image of Jonathan Dunn flashed through Jack’s mind. He pictured him in this very cabin. He saw him swinging an ax downward—blade cleaving flesh and bone and busting through the arm of the chair. Jack staggered backward, too weak to stand. He slammed into the wall behind him and slid to the floor.